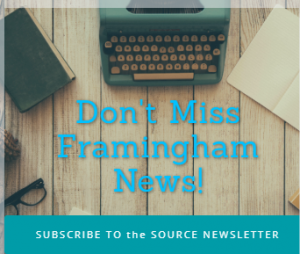 BOSTON – Framingham senior track captain Ashley Wilson finished second in the 55-meter hurdles at the Division 1 state track meet at the Reggie Lewis Center in Boston on Saturday, Feb. 18. Wilson, who was in third place after the preliminaries with a time of 8.87, finished second behind Chelmsford’s Kristen Hohenstein in the finals. 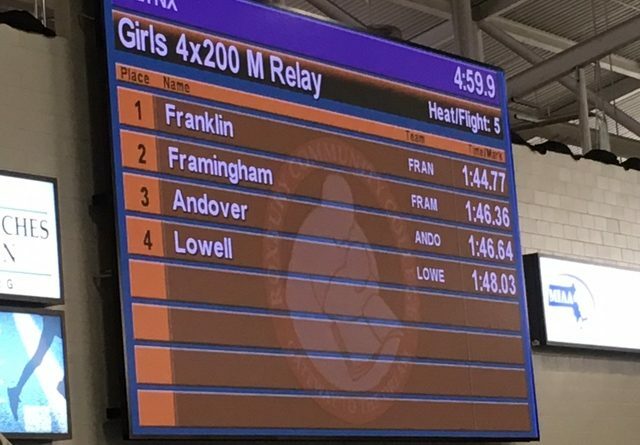 Hohenstein ran a 8.60 race, with Wilson crossing the finish line in a personal best of 8.68, The mark also sets a Framingham High record. The Flyers 4 by 200 relay team finished in third place overall at the state meet with a season best time of 1:46.36 minutes, said head coach Chris Collins. Franklin High won the race in 1:44.77 minutes. Wachusett Regional finished in second in 1:46.23 minutes. The squad of Leche Small-Brown (sophomore), Jenny Ribeiro (senior), Wilson, and anchor Zoie Carter (a junior captain), took a half second off of their prior best time, said Collins. They will aim to break last year’s school record at the All-States meet on February 26. Framingham sophomore Grace Poku competed in the 55-meter dash and ran a 7.76 time, finishing in 15th place. She slipped on the start, said Collins. Carter finished ninth overall in the 300 meter race, despite being sick before the race, said Collins. Her time was 42.84 seconds. She just missing a second medal there by 0.2 seconds, said Collins. The Flyers finished in the top 12 in the state at the meet, said Collins.